Simply Me: Won't you be my friend? Anyway it really got me thinking that I don't do my part for shelter dogs. I don't have lots of money to donate to them or money to buy things to go towards them..... So after a long deliberation I decided to make a new post in hopes that I can at least do something for them.... I'm not sure how often I will do this, but I really hope its something everyone likes. It is the "Won't you be my friend?" and in it I would like to post about shelter dogs currently up for adoption! So maybe someone will see my post and be like that is my dog! I hope to really help some of these dogs get homes! So for my very first post I'm going to post a dog from the Hillside SPCA, that is were I adopted my Rocky. And just so everyone knows this post and this "Won't you be my friend?" project is all for him! Its my way to honor him. So in honor and out of love for Rocky here is my first "Won't you be my friend? Dog!" 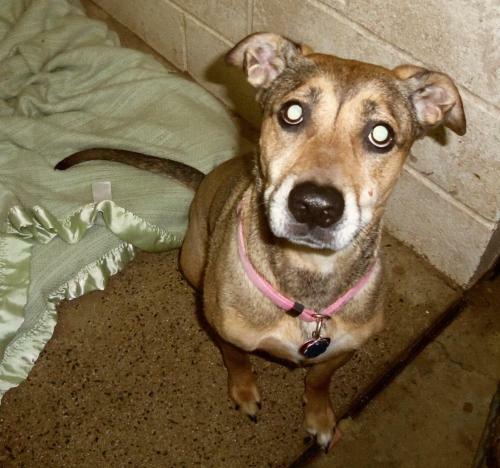 Bella is a 4yr old shep mix. Bella gets along with kids and cats too. Bella has been spayed and is ready to be adopted. Or you can even visit them their hours are: 11am to 3pm everyday including Saturday and Sunday. Hillside does adopt to people anywhere, not just in Schuylkill County. Remember a dog is a life time responsibility. They need love and care. Adopting or deciding to be a pet owner is not a decision you should make lightly. But if you are ready for a pet and ready to take that step in making a life long friend who will always love you even if your having a really bad hair day or if you clothes don't match, a friend who will get excited just because you are home even if you only been gone for 5 minutes, a friend who will sleep at your feet at night and not care if you snore, a friend who will eat your burnt dinner and act as if it taste amazing, a friend who will love you just because your you.... If you are ready for that friend Then please consider adopting. If your interested in adopting today then please consider Bella, because something with a face that sweet deserves a loving home. I will also put all this info in its own tab so its easy to find. This blog post is also part of the Blog the change for animals. Bloggers and blog readers, please help us publicize Bloggers Unite for Dog Rescue, a special online global event held on July 23, 2012 stressing the importance of dog adoption. Together we can make a difference!